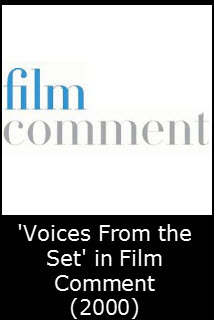 Originally published on September 1, 2000 @ Film Comment. During the 1970s, Tony Macklin conducted a stunning series of interviews for the magazine Film Heritage, dealing with all aspects of the industry, from costume designers to critics, writers, directors, and stars. This interviews are compiled in Voices from the Set: The Film Heritage Interviews, edited by Macklin and Nick Pici (Scarecrow Press, 335 pp, $39.50). Macklin was working at a time when an old guard was still around and a new one was coming in, enabling him to speak to what now seems a veritable dream team, including Hitchcock, Altman, Hawks, Scorsece, John Wayne, Warren Beatty, and others covering the spectrum of personalities and responsibilities that make a film happen.